I received this message recently from a visitor to out Underhill Guest Book. I thought you would be interested in another eyewitness account of the sinking of the Underhill. Two family members are looking for information. I was wondering if anyone knew my granduncle Stanley J. Abcunas. As I research and document my family tree, I've become interested in the story of DE-682. As I was born almost 23 years after he gave his life, I never knew Stanley. If anyone has any stories or pictures of him, I would be must grateful. Thank you for defending our great country. I get several request from relatives about loved ones that didn't survive the July 24 1945 attacked on the Underhill. I only wish that I could remember more about the crew. You would think that living with 230 men on a small ship for almost three years, a person would get to know every one. In a way it was like a large family, with Captain Newcomb and the other officers telling us what to do each day. It got to be routine and even boring. The only things that became etched in my memory are the unusual and even shocking happenings. Like Lt. Joe Timberlakes drawing his 45, and telling me "no one leaves the ship." Then afterwards seeing our own gunfire sink what was left of the Underhill. 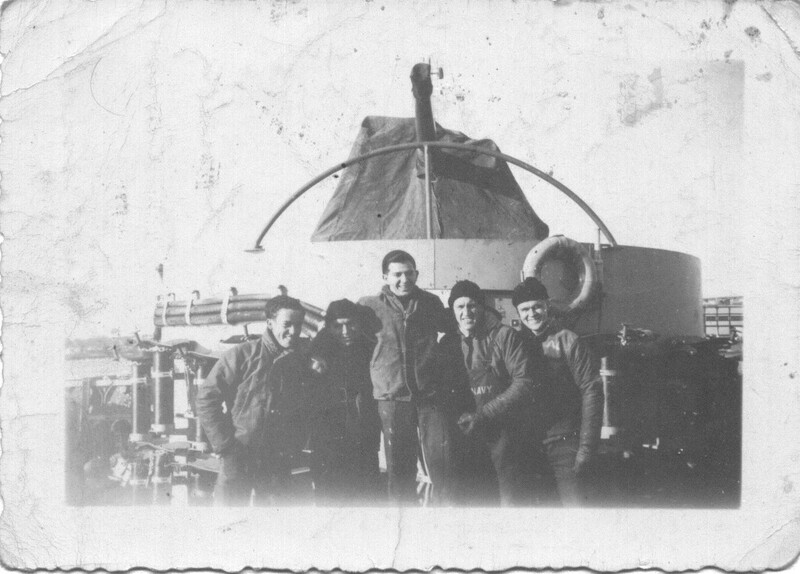 Before they opened fire, they circled the ship for anymore survivors. There were several bodies floating in the water. I may be wrong, but the name "Abcunas" was stenciled on the shirt of one of the bodies. They were given orders from Convoy Command to leave the dead and just pick up the living. Later another ship picked up some bodies in the area. I could not say if Abcunas was with them. I wasn't able to view the picture you put on the web. The"names" of the crew members are what I recognize most. Just can't put a face on them. Aboard the ship they always said "Abacunas." This note is from Ernest Clackum, son of Ernest Clackum Jr, survivor. 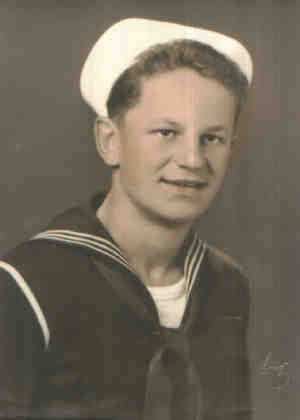 He would like to know if any of his dad's shipmates are still alive and might remember him. He says "I know he must have been tight with these guys or he wouldn't have sent their pictures home". The 1st picture is (LtoR)D.J. (David)Doar GM/2c, Joe "Doc" Manory PhM/2c, and my dad, Ernest Clackum, Jr. GM 2c. There is no indication on the back of the picture as to where or when this was made. The second picture is(LtoR)D.J. Doar, Ed Hancock EM/2c, "Doc" Manory, L.C.R. Nadelhoffer GM 1/c, Alfred "Al" A. Pihlaksar QM 3/c. The names are on the back of the picture back. It is dated 1/45 New London, Conn. and says, "some ship mates". This is my dad's picture, Ernest Clackum, Jr. S/2C. Later he finished gunnery school(Bermuda) and was GM/2C. The picture says on the back it was made on Saturday, March 20, 1943. I think he was home(Marietta, GA) on leave from Great Lakes after he completed basic training. Not sure, but that's what I remember being told.